Following the top 20 tracks for 2012, which we ran over Christmas, we have been debating what to do next and over the next ten days we are going to get in touch with our unselfconscious selves to celebrate the final arrival of Spring. We did debate calling this ‘Guilty Pleasures’ but that implies tackiness and easy listening, when really what we are sharing is ten tracks that just make us smile, that we love even though they may not be trendy, or fit in with what we normally like. The only criterion is that they give us pleasure, music that appeals to the ‘id’ rather than the ego. I’ll post first each day and then Andy and Roy will most likely nominate in the replies underneath,all being well. Please do post your own nominations. As they say in the best brainstorming meetings, ‘There are no wrong answers here’. So I am kicking off today with my first nomination, my number 10 – Sparks with ‘This Town Ain’t Big Enough For The Both Of Us’. 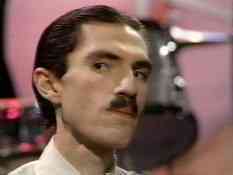 The second that piano riff comes on the radio you can’t help but grin – unlike Ron Mael, whose glaring at the TOTP camera predated punk by a few years. Number 2 in the UK in 1974, this was just what a 10 year old me had been waiting for. A cracking start and an absolute stone-cold unclassifiable classic ! Apart from being a monsterously infectious dancefloor track it seriously annoyed po-faced Pink Floyd fans, for that alone it made me smile ! Two fine openers, although in the case of the Scissor Sisters, I prefer “Laura” for the Thomas the Tank engine theme that kicks it off. “This town” is unquestionably a classic and never fails to make one smile. As for my choice, I’ve selected a former teenage actress, who unleashed this classic on an unsuspecting public earlier this century, and changed many people’s opinions in the process. Pure pop perfection; surpassed only by the inspired ‘Can’t Get Blue Monday’ mash-up. Here’s my contribution: John Otway and Wild Willy Barratt – Really Free!